What does a Botanical Horticulturist do? I’m a Botanical Horticulturist. My job involves caring for one of the most diverse collections of plants found under one roof, in Kew’s behind the scenes glasshouse, the Tropical Nursery. The plants I care for come from all over the world and are grown in different zones within the glasshouse. The different zones provide specific climates which best represent the conditions these plants would come across in their natural habitat. The nursery holds plants of all shapes and sizes from delicate orchids to strange insect eating pitcher plants. The job of a botanical horticulturist is really varied but involves working out the best way to grow and care for plants with the materials we have available in the nursery. 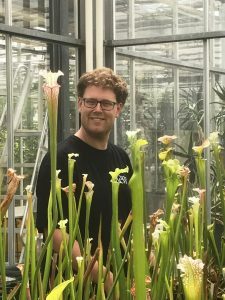 I started in Horticulture as an apprentice at Kew. I got to work all over the gardens from the Arboretum to the tropical display glasshouses. Its a brilliant environment in which to learn, surrounded by people with lots of knowledge and experience. I love working out how to grow and propagate rare plants. It’s exciting to think that my work contributes towards the survival of a species and is a form of conservation. I rarely go through a day without learning something amazing. What’s difficult about your job? Some plants are very difficult to grow in artificial growing environments and this, along with plant pests and diseases, can sometimes make the job challenging. In order to do my job you need to be organised, observant and flexible. You have to be able to work well in a team, communicate well, and be ready to learn from your colleagues. An ability to research and put into practice what you learn about specific plants is a valuable skill. Its useful to obtain a recognised horticultural qualification to provide a good grounding in the subject. There are lots of opportunities for aspiring horticulturists to start out. I started by balancing practical horticulture with a basic horticultural qualification. If you don’t have garden space in which to practice try looking around your local area to see if there are any gardens nearby where you could volunteer. Once you’ve gained a little experience and knowledge you are in the perfect position to apply for apprenticeships and traineeships at a botanic garden such as Kew. How do you think your job could change in the future? Today one in five plant species face the risk of extinction. In the future I believe botanical horticulturists will play a greater role in helping to conserve plant species not only in botanic gardens but also in the countries where plants originate. Botanical horticulturists may well be a vital key in protecting the biodiversity of our planet. What is it like to be a Safari Park Ranger? What is it like to be an Aquatic Animal Vet?